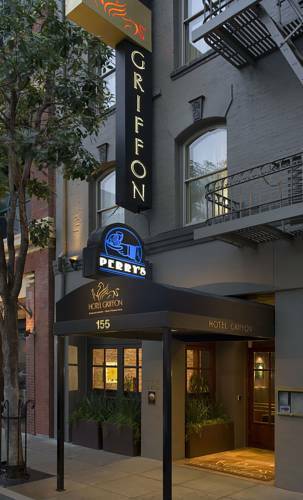 Voted Best San Francisco Boutique Hotel and *Best 24 Hour Getaway* by San Francisco Magazine; Hotel Griffon is the ideal choice for business and leisure travelers who seek a pleasant and luxurious alternative to the chain hotels. Each of the 62 well-appointed guest rooms and suites offers a work desk; complimentary Wi-Fi; speaker phone with personalized voicemail; alarm clock; flat screen television; new bedding package with plush top mattress and duvet cover; coffee maker; in-room safe; plush robe; hairdryer; and environmentally sensitive bath amenities. The San Francisco luxury accommodations are 100 percent smoke free. The hotel*s restaurant and bar; Perry*s on the Embarcadero provides a lively atmosphere and is open seven days a week; for breakfast; lunch and dinner; while offering in-room dining for hotel guests. This boutique hotel in San Francisco also provides daily complimentary electronic newspapers; morning local town car service and nightly turndown service. Enjoy the ideal location for exploring attractions in San Francisco. Conveniently near the citys finest restaurants; shopping; nightlife and recreation. Less than 2 blocks from the famous Cable Cars; BART and MUNI trains; ferry service to Sausalito; Tiburon; Larkspur and the East Bay. Jump on the F-Line Trolley and in just minutes you will be at Fishermans Wharf and Pier 39. The hotel is down the street from PacBell Stadium for sports enthusiasts. Close to the Financial District. ~3 miles from San Francisco. ~7 miles from San Francisco.